Soak up the Bellmoor's classic vibes you remember as a kid, then head out to make a new generation of family memories. Our iconic hotel is just two blocks from the beach and is close to the best shopping, dining and nightlife, too. Hop on the complimentary beach shuttle and spend the day building sandcastles with the kids. Escape for the evening for a romantic dinner at nearby restaurants. Our convenient self-parking and electric vehicle charging stations make it easy to arrive, park and forget your cares for as long as you're here. 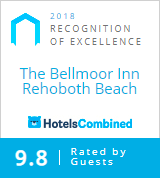 Everything's walkable, meaning you have more time to relax and enjoy our Rehoboth Beach hotel near the boardwalk.